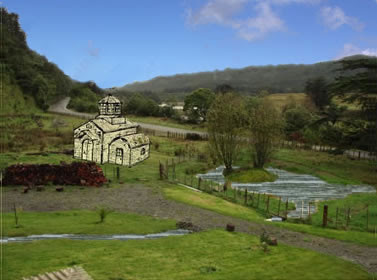 We are pleased to present the location, the first buildings and future plans for the completion of the first Orthodox Christian Monastery in New Zealand. One can ask, what is the reason for the existence of a monastery? We Orthodox Christians can very easily answer that such a monastery is necessary, for one is the Holy and Catholic Church which supports, provides spiritual shelter and is the center for every feeble soul. In this idyllic environment Levin, an estate of 104 acres, will serve God first, as THE FIRST holy male monastery of the Holy Metropolis of New Zealand, the Ecumenical Patriarchate, and in the name of the Synaxis of the Archangels (9x5) and the adjacent church of St. Basil (6x2.5) will cost about 60,000 euros, or $130,000 N.Z. Thank you for your support. May the Archangels be of help to you and your families and may you have the blessings of Saint Basil, the organizer of Orthodox Monasticism.